Congratulations on your purchase of the Acer Air Monitor. It is a first, positive step in helping you improve your quality of life. This simple device monitors the air quality within its immediate surroundings. Temperature - This metric directly relates to comfort and mood. Humidity - Moisture leads to colds, flus, and risk of toxic mold formations. VOCs - Volatile Organic Compounds are toxic chemicals that can cause skin and respiratory irritation. Note: According to experimental studies, in regards to general indoor living environments, CO2 and TVOC (Total Volatile Organic Compounds) concentrations have a positive correlation, and can accurately represent the indoor air pollution index. Thus, we derive our CO2 equivalent (CO2eq) value from our TVOC measurement. Dust - PM2.5/PM10 (fine/coarse particulate matter) travels deep into our respiratory system and can trigger asthma, allergies and other related health problems. 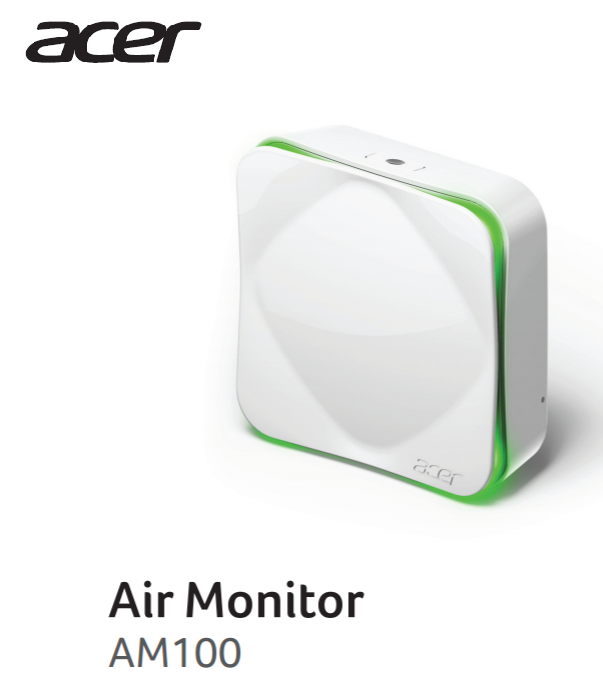 Through visual indicators on the device, as well as more detailed information on the app, the Acer Air Monitor helps track and gives advice on how to improve the air quality, your health, and the health of the ones you care about.